EBRD-China tandem may exacerbate hydropower crisis in Europe? A wave of hydropower development fueled by European public funding and EU companies may be further exacerbated by China’s membership in EBRD. 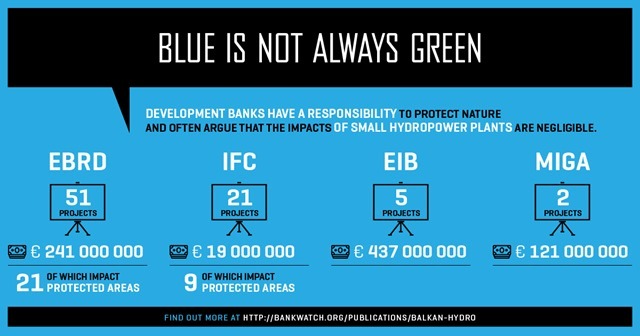 A new study, that Bankwatch deals with European public funding and EU companies, which are fuelling a wave of hydropower development and endangering pristine river environments in the Balkans: Pristine Balkan rivers threatened by European "green energy" funding for hydropower. More news came on December 14, when Board of Governors of the European Bank for Reconstruction and Development (EBRD) has approved a request by the Chinese authorities for China to become a shareholder of the Bank. China is the biggest hydropower-builder in the world with Chinese firms participation in about 400 large dam projects overseas. Chinese firms are known for agreeing to build hydropower projects, which were rejected by more picky international players. The Gibe III in Ethiopia, or Egiin Gol in Mongolia, both threatening to destroy World heritage sites downstream – are prime examples. It is scary to imagine how China’s vast resources and engineering capacity can be combined with EBRDs new shameless appetite for hydropower on Eurasian Rivers, which conceptually are all part of the "Silk Road" development initiative promoted by Chinese authorities. Last time take a look at fragile Balkan rivers: Troubled beauty – How pristine rivers in the Balkans are in danger of being dismembered by hydropower installations.